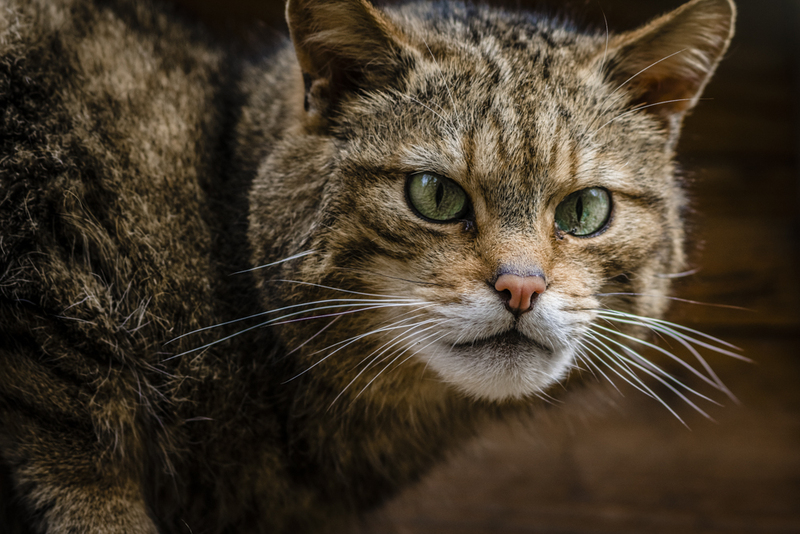 Protecting the future of the Scottish Wildcat – the UK’s only native feline and most endangered mammal. Since 2011, Aigas Field Centre has been contributing to an important national programme to bring back the Scottish wildcat from the edge of extinction. 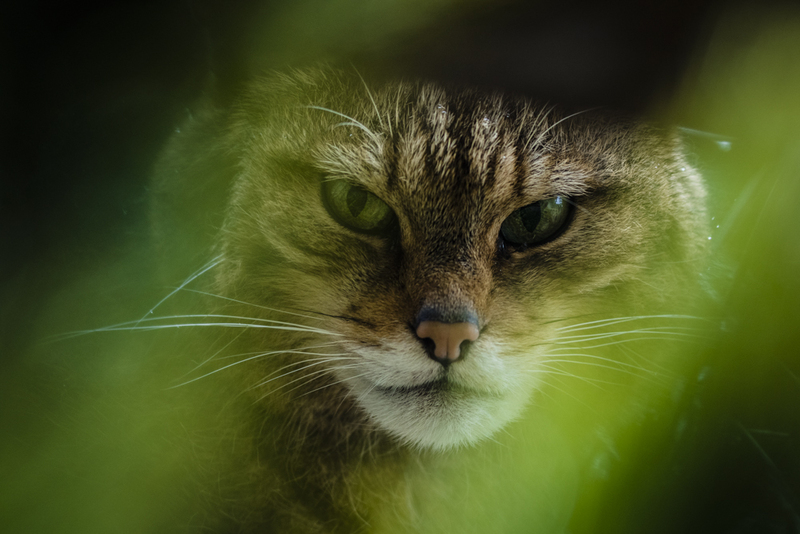 We are working in partnership with Scottish Wildcat Action, which includes efforts to protect what’s left in the wild and a conservation breeding programme led by the Royal Zoological Society of Scotland (RZSS). The Scottish Wildcat (Felis silvestris silvestris) is larger than its continental cousins. It has the appearance of a large and muscular tabby cat with a broad, flat head and a distinct fur pattern, including the distinctive dark rings around the thick, blunt tail. Wildcats and domestic cats can hybridise and this is now the greatest threat to the gene pool of the Scottish wildcat. Wildcats are solitary and occupy large ranges, which rarely overlap except for when the female is in oestrus, which she will advertise through her scent marking and a blood curdling wailing (no doubt the source of much Highland mythology!) They are almost purely carnivorous and consume almost every part of their prey, which consists mostly of rabbits, voles and other rodents and some ground nesting birds. What is clear is that wildcats need our help. They were once found right across mainland Britain but a combination of persecution and habitat loss has driven them to the brink of extinction. Although now fully protected by law, they still suffer through road kill and illegal trapping and poisoning. Wildcats mate in the middle of winter and after a gestation period of approx 55 days, they give birth to a litter of typically 2-3 kittens. So why are they in decline? The main threat to the Scottish Wildcat is hybridisation, or interbreeding, with domestic cats. Their offspring are fertile and are a mixture both in their appearance and genetics. Disease can be transmitted from domestic cats to Scottish wildcats. This is a particular problem where there are a lot of feral cats (domestic cats that are living in the wild). Wildcats were historically persecuted by gamekeepers and in more recent times, mistaken for feral cats, which pose a threat to game birds. The captive population of Scottish Wildcats is vital to their survival and it is of the utmost importance that we work together to improve the genetic purity, increase the captive population and build a pool of wildcats that will be released into the wild once the threats to their survival have been reduced. Please adopt one of our Wildcats; contributing towards food, enclosure building and maintenance, animal husbandry costs and veterinary fees. Your donation will go to the Aigas Trust, a registered charity. We are aiming to raise £150,000 by 2021, with the aim of increasing the number of our breeding pairs of wildcats from one to three, so we urgently need your help. £25 – Receive an adoption pack including a personalised thank you letter, information about the project and wildcat postcards. £50 – Receive an adoption pack and a signed copy of one of John Lister-Kaye’s books of your choice. £150 – Receive an adoption pack, a wildcat mug, designed by local artist Becky Lister-Kaye, and a signed copy of one of John Lister-Kaye’s books of your choice. £250 – Receive an adoption pack and a signed A4 Laurie Campbell print of a Scottish Wildcat. There are 5 to choose from. All adoption packs will come with a biannual newsletter, sent in July and January.